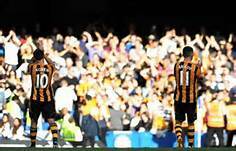 Hull City will be hoping to continue their fine home form when they welcome Stoke City to the KC stadium on Saturday. The Tigers have only lost one game at home this season. Hull will hope to get a win on the board after a rather unlucky draw at Swansea when they could have snuck a win only for some critical decisions to go against them. Stoke on the other hand defeated Chelsea at the Britannia last weekend 3-2 after a super winner by on loan Liverpool man Oussama Assaidi. Going into the mid table clash, the Tigers find themselves sat 12th in the league table with 18 points after 15 matches, five points above the dreaded drop zone. Meanwhile their opponents Stoke are just one point but also one place behind them in 13th place. Hull does not have any injury concerns; they will play without Stephen Quinn , Sone Aluko and Joe Dudgeon who are all long term injury absentees. Stoke’s Bosnian shot stopper Asmir Begovic who has been in fine form this season is currently struggling for fitness, he may be replaced by former Danish international Thomas Sørensen in the heart of the Stoke City goal. They will not have Jon Walter as he is suspended for this tie at Hull, Matthew Etherington is injured, Dutch international Erik Pieters returns to the side. Previous articleCan Manchester United Save Their Season?